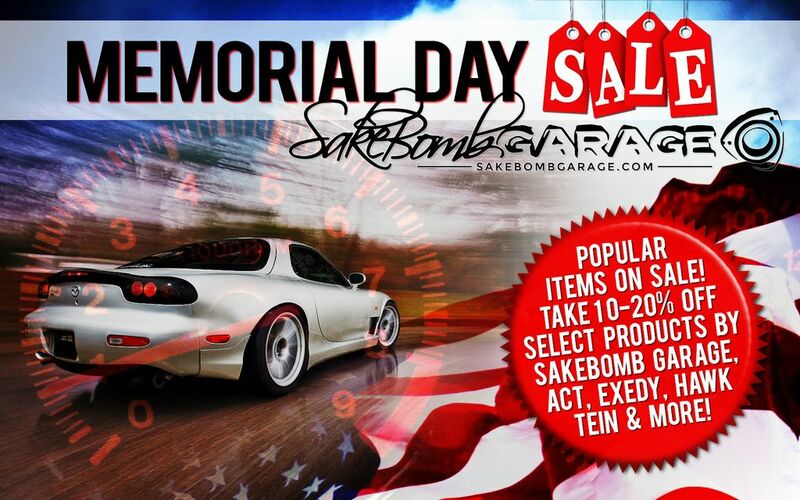 SakeBomb Garage SakeBomb Garage "OEM appearance, uncompromised performance"
Memorial Day 2015 Sale @ SBG! We here at SakeBomb Garage would like to express our gratitude to the men and women of the armed forces who have, and continue, to keep us safe. The freedom to enjoy the passions and pastimes that each of us hold dear is not something that we take for granted... while we live in a country that allows us the freedom to do what we love, this freedom has come at a cost to those who have risked their lives to keep us free. We would like to remember the active duty armed forces, veterans, and fallen soldiers who dedicated and sacrificed their lives so we could live ours. Contact us any time with your Armed Forces ID and we'll do our best to help you build your dream, as you've fought for the freedom for us to build ours. Through this Memorial Day weekend, we are happy to offer everyone FREE SHIPPING on all items within the continental US as well as offering sale pricing on many items on our website! Valid through Monday 5/25/2015 at Midnight PST. -SBG EWP Competition Kits (limited quantity) $65 off! -SBG Dual Oil Cooler Kits $75 off! -SBG Competition AP Brake Kits (limited quantity) $175 off! -SBG IGN-1A Ignition Coil Kit $65 off! -SBG Stainless Brake Lines (FD/NA/NB/NC/RX8) $15 off! -SBG Stainless Clutch Lines and Extended Clutch Lines (NA/NB/NC/FD/RX8) $5 off! -SBG OEM Replacement Spark Plug Wires (FD/NA/NB/NB2/RX8) $15 off! -All Clutches & Flywheels from ACT & Exedy! -All Hawk & Endless brake components & pads! -Radiators from Koyo & Mishimoto! We will be adding new items to the sale each day, so check back often for new sale prices! The sale ends on Monday at Midnight Pacific Standard Time, so don't wait! Want something that isn't on our list, or even on our website? Follow us for product updates and more!